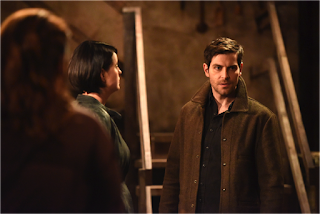 It’s the penultimate episode of Grimm and things are getting worse and worse for Nick and his faithful team! Let’s dive right in, shall we? We left off last week with Skull Guy unleashing his glowing green staff and Eve going full Hexenbiest. Eve and Nick battle it out with Skull Guy in the Other Place, while back in Portland at Monroe and Rosalee’s house, Monroe, Adalind, and Renard try to figure out how to get there to help out. Monroe has a theory, based off of what Renard’s mysterious friend told them, that this other plane of existence is hell and Skull Guy is the guardian, a.k.a the devil. 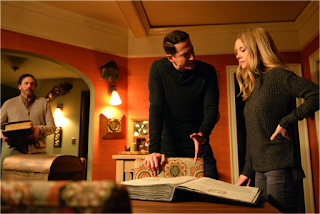 So while Adalind and Renard consult the Hexenbiest spell book, Monroe pulls out his trusty family Bible (Wesen edition, naturally). In the Wesen Bible, hell isn’t the hell we think of — all fire and brimstone. Instead, it’s a beautiful garden overrun by beasts and hell “resides within” the beasts. Sounds pretty identical to where Eve and Nick are. The Wesen Bible even has a drawing of the devil, and wouldn’t you know, he bears an uncanny resemblance to Skull Guy, complete with staff. Monroe also has an idea of how to reopen the portal. He thinks Diana possesses the ability to open it, but Renard and Adalind are completely against involving their daughter in any of this, since Skull Guy wants to make her his child bride and all. Of course, their shouting match about it wakes Diana up and she hears what they’re saying. Over at the spice shop, Hank, Wu, and Rosalee are consulting the Grimm books and they come across a drawing of a skull with some ancient German text. When translating it, they figure out that Skull Guy used Eve to lure Nick to the Other Place. Skull Guy needs the power of a Grimm to cross worlds, get to theirs, and take his bride, and now he has Nick. As Rosalee’s piecing all this together, she also remembers that the strange markings on the cloth wrapped around the Elder Wand were a calendar that pointed to March 24 as the date the stars would align and something “very bad” would happen. It’s all coming together now! Rosalee, Wu, and Hank decide they absolutely cannot open any portal to the Other Place, lest Skull Guy jump through. 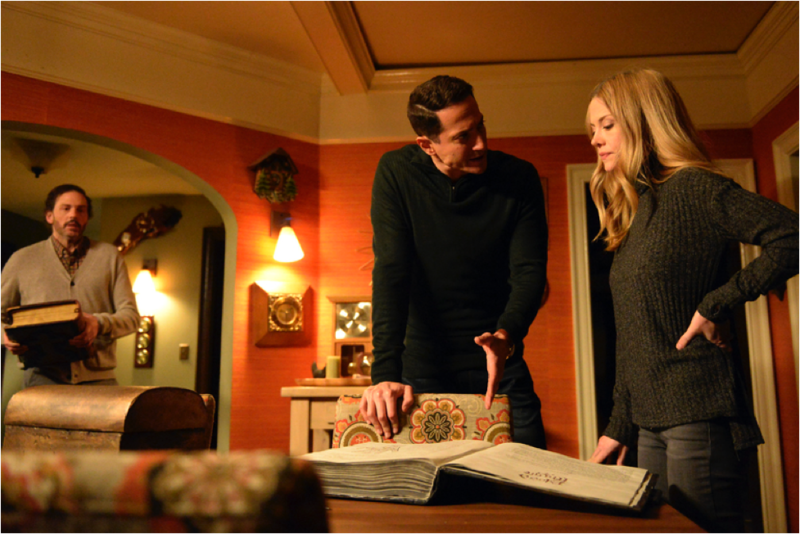 Back at the house, Monroe has finally agreed to let Adalind open the portal herself and not involve Diana. Just then he gets a frantic call from Rosalee. But unbeknownst to them, Diana is in the living room, and she has the Elder Wand. She opens the portal and Adalind, Monroe, and Renard run in, screaming at her to stop. In the Other Place, Nick, Eve and Skull Guy see the portal open. Nick manages to grab Eve and they both get sucked through. After they’re gone, Skull Guy saunters through, too. Uh oh. Back in Portland, Nick and Eve come flying back through the mirror in Rosalee and Monroe’s house. Eve is no longer woged. Nick immediately grabs his Elder Wand and heals himself from the wounds Skull Guy inflicted. The team is relieved to have them back, but Monroe shares what Rosalee was trying to tell them — that if they came back, they wouldn’t come back alone. Nick looks around. It sure looks like they’re alone. Monroe points to the mirror, which has been completely destroyed and definitely won’t be moonlighting as a portal again any time soon. Just then Rosalee, Hank, and Wu bust in. Everyone’s relieved Skull Guy isn’t there, but they’re not entirely convinced Skull Guy missed his big opportunity. Nick and Eve fill the team in on their time in the Other Place, and describe Skull Guy. He also had a name in the Other Place — Zerstorer. Monroe tells them Zerstorer means Destroyer. Before they can ponder that for too long, Diana tells Eve that Eve is different now, and that part of her stayed in the Other Place. Adalind asks if Eve feels any different. Eve isn’t sure, but when she tries to woge, she can’t. She’s not a Hexenbiest any longer. Just then Diana starts hyperventilating, crying, and screaming, “He’s coming! He’s coming!” Nothing Renard or Adalind does can console her. Meanwhile, over at a creepy gas station, bats start dropping dead from the sky and suddenly a guy minding his own business in the station bathroom is stabbed through the chest with a staff that emerges — with Skull Guy — from the bathroom mirror. As Skull Guy comes through the mirror he transforms into a very attractive (and completely naked) human-looking man. Skull Guy — now Naked Man — emerges from the bathroom and promptly kills the gas station attendant with an electrical charge from his staff. Back at Monroe’s, Diana is still inconsolable but the team vows that they will all protect her. Adalind takes her to another room to calm down and the team brainstorms where to hide her. Nick decides they should take her to the cabin in the woods that he and Monroe discovered on his first case after realizing he was a Grimm. Apparently, they assume the cabin is still standing empty after six years or that they can easily evict its current tenants. And no pause is given to whatever bad juju the cabin might have, considering it was where a Wesen serial killer committed a string of murders. Nick thinks this is the perfect place because it has no connection to any of them. I think it’s the perfect place because producers didn’t want to splurge on a brand new set design on the second to last episode. Either way, Monroe points out that Skull Guy may have a connection to Diana that enables him to track her down no matter where she’s hiding. So, Rosalee suggests an additional protection — a Hexenbiest charm that protects a child from danger coming his/her way. Renard says his mother used the charm on him several times when he was a child and, as far as he knows, it worked because he’s still alive despite the royal family trying for years to kill him. While Hank and Wu head to the precinct to check and see if there’s any unusual chatter about a Skull Guy coming through, the rest of the team applies the potion to Diana and then heads off to the cabin. Meanwhile, Trubel is back! She’s down in the tunnels looking for the Elder Wand when she notices the symbols. She’s been gone awhile and sure has a lot of catching up to do. Nick, Adalind, Renard, Diana, and baby Kelly arrive at the cabin and it looks exactly the same as it did when the Blutbad serial killer lived there. Complete with the hidden door in the floor that leads to a little girl’s bedroom where the Blutbad kept his victims. Not creepy at all. Monroe, Eve, and Rosalee are back at the spice shop, poring over Grimm books. Turns out this special staff has quite the legacy. Not only does Monroe’s Wesen Bible connect the staff to the devil, but also to Moses, David, and a host of other important figures from the Bible and several other religions. Just then, there’s a noise upstairs. Fortunately, it’s just Trubel come to find them, and Monroe wastes no time getting her caught up to speed. Over at the precinct, Wu and Hank hear about some suspicious activity at a gas station and take off to investigate. There’s two dead men (one of whom is naked because Skull Guy stole his clothes), and lots and lots of dead bats everywhere. Nick joins them at the crime scene and confirms the fatal wounds look like something Skull Guy could have caused with his staff. Speaking of Skull Guy, he’s winning friends and influencing people as he wanders Portland. He almost gets hit by a car as he meanders into traffic. The driver shouts at him. Then he happens upon some homeless people in an alley. He mimics what the driver said to him to the homeless people and then begins mimicking them, which they do not appreciate. When one of them starts to attack him, he drops his staff and it turns into a snake that kills the man. Then he walks away, mimicking the man’s screams. Well, I guess that’s one way to teach yourself English. Rosetta Stone’s not for everyone. Back at the spice shop, Trubel is up to speed and she, Rosalee, Eve, and Monroe are brainstorming how Zerstorer got his bony hands on an all-powerful staff connected to so many important historical figures. Eve also mentions a key detail – that when she saw the staff in the Other Place, it was cracked and weathered and looked like it had been broken apart and put back together again (anyone else thinking the Elder Wand is a piece of this staff?). Monroe says he remembers reading a prophecy about a staff with the power of the gods that can’t be destroyed. In the prophecy, the staff was broken into 100 pieces and scattered across the world to prevent evil from using it. Eve guesses that the Elder Wand is a piece of the staff (shocking!). That must be what Zerstorer is after. Eve calls Nick and tells him to come back to the spice shop immediately. Back at the cabin, Diana has a dream that Skull Guy shows up and tries to take baby Kelly. She wakes up screaming and when Renard and Adalind try to tell her it was just a dream she explains that no, she knows now that Skull Guy wants them both — her and Kelly. This is super problematic because the concealment charm Rosalee whipped up was only used on Diana, not Kelly. Nick gets back to the spice shop and Rosalee, Monroe, Eve, and Trubel fill him in: if Skull Guy gets ahold of the Elder Wand — the last piece of the staff — he’ll be unstoppable. Nick gets back to the precinct and fills Hank and Wu in, too. They weapon up with as many guns and as much ammo as they can find. Meanwhile, Trubel hears shots where she’s at and comes outside to discover two dead cops. She calls Nick and lets him know just as Nick hears gunfire out in the main precinct area. Skull Guy is in the precinct! Nick, Wu, and Hank race out to confront him and he’s no longer looking human – he’s back to being a literal Skull Guy again. He uses his staff to blast all the cops out of the way. This enrages the werewolf within Wu and he woges and charges Skull Guy, who rams him through with his staff. Wu collapses and unwoges. Nick rushes to his side but there’s nothing he can do and Wu dies. Nick tries to charge Skull Guy but he just bats him away. Then Hank unleashes a round of gunfire on him — with no effect. Skull Guy stabs his staff through Hank’s neck and Hank dies instantly. Nick rushes him again, and again is thrown backward. And then the episode ends! We’ll have to wait until the finale to find out who prevails. My guess is Nick and team — utilizing Diana’s many powers — will be able to reverse time or somehow resurrect Wu and Hank (perhaps with the Elder Wand?!) and everything will be a-ok. I hope so anyway. I would be super bummed if they end the show by killing off Hank and Wu, who are arguably two of the best characters.